When you think of the slasher genre, it is easy to think of Nightmare on Elm Street, Friday the 13th, and Halloween. However, the movie that really set the stage for this type of movie was The Texas Chainsaw Massacre. Not only was it ground breaking, but it is one of our favorite horror movies! Chainsaws always make a horror movie better. The Texas Chainsaw Massacre has spawned 4 sequels (if you consider that Texas Chainsaw 3D is a direct sequel to the original) and a remake with its own sequel. For this pairing, we were inspired by the Texas setting and the fact that the family worked at the local slaughterhouse. 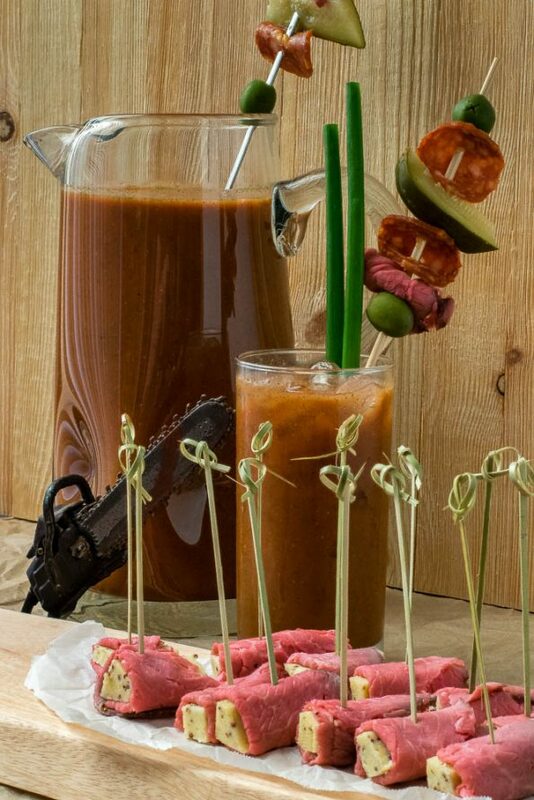 We decided that for the cocktail we would do our version of the Bloody Mary. We decided to call our version the Bloody Marilyn, named for Marilyn Burns who portrayed Sally Hardesty in the original film. For our snack, we went with roast beef as a kind of tribute to their family’s lifestyle and career path. Next week we will have our last slasher themed pairing for this Halloween! Who is your favorite slasher? We are already starting to plan for next year so leave your comments below or use the hashtag #GeekEats! Also, be sure to visit for more horror and Halloween fun! Add desired amount of vodka. Top with Bloody Marilyn Mix. Cut cheese into cubes about an inch long and 1/2 an inch wide. I don’t eat beef but my husband would love it. So making the beef bites for me and for me – Bloody Marlin sounds so good. as holiday season is coming, this combo is perfect for parties! This is so creative!! Love it! Thanks for sharing! Perfect timing for halloween! That’s a great film and the bloody marilyn looks tasty!